As one who is a big fan of sequins and logo tees, I was uber excited to have this casual fancy look on Peony Lim enter my Pinterest feed. I try to get some use out of my pins because otherwise it just becomes a virtual junk drawer. 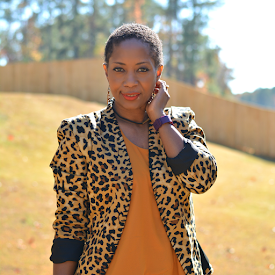 My goal is to do more with the outfits, recipes and DIYs that inspire me. Hold me accountable. Please. Sifting threw my closet, I found a few similar pieces and decided to Thrift That Look! I love logos and graphics on t-shirts. 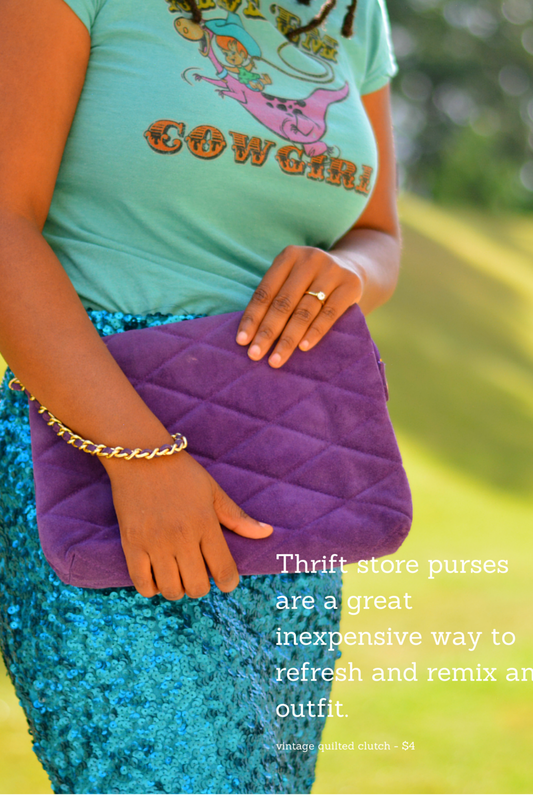 They are super cheap and abundant at thrift stores. They have so much versatility. They go with lots of stuff in your closet. You can dress them up or down. When it's the right material, they just get better with time. They make great DIY projects and can be transformed into skirts, bedazzled, dyed and so much more. Yes, it's all there on Pinterest. Sequin skirts give me a good feeling. I love all of the sparkle and the lovely designs they make all over when the sun hits them right. 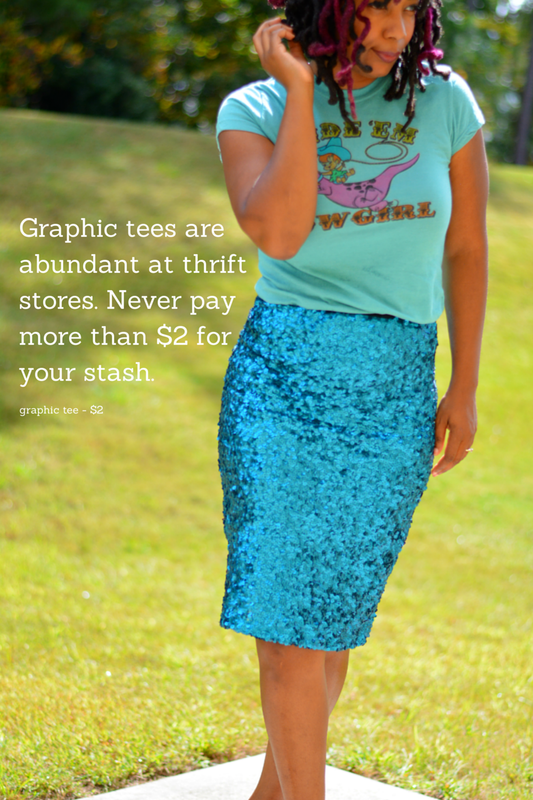 So far, I haven't come across many thrift store sequin skirts. I have managed to find 3 over the years plus the dress that is now a skirt. It was $5. So much better than the $50 retail price. 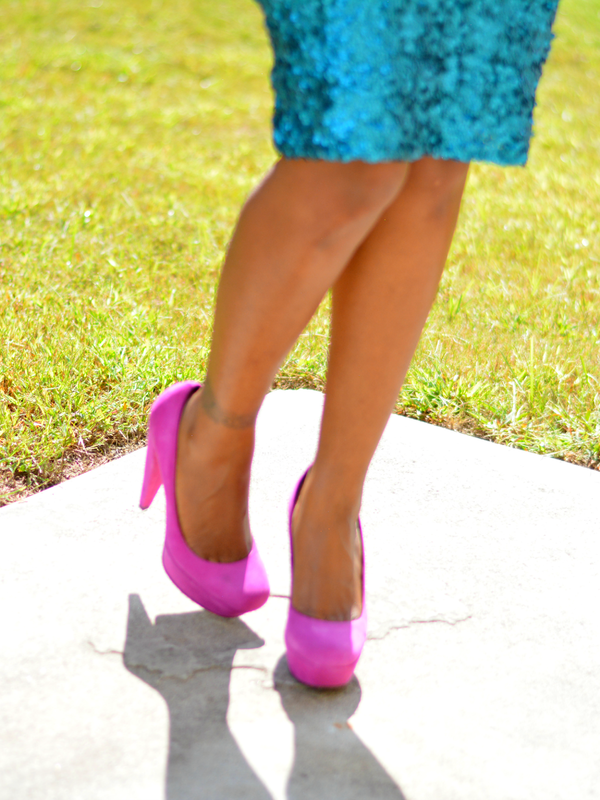 It's hard to just throw on a sequin skirt and call it casual. Tops yes but not the skirts. I'm not going to run errands in it. I'm afraid of sequin loss and snags so I reserve them for girls night out and the rare date night (sigh). I like tees and sequins together. They're at such opposite ends of the spectrum yet they pair up very well. What do you think? Do you like tees and sequins together? Great tips. Love the outfit! I love these casual and dressy coming together. Very cute color combo! These look great. Will definitely try! I DO love this! The colors go so well together! I can't wait for another installment of thrift that look! I would do anything for that dress! I'm a sucker for sequin dresses and I'm so glad my thrift store always carries them. This is such a stylish look! Weeerk it honey! 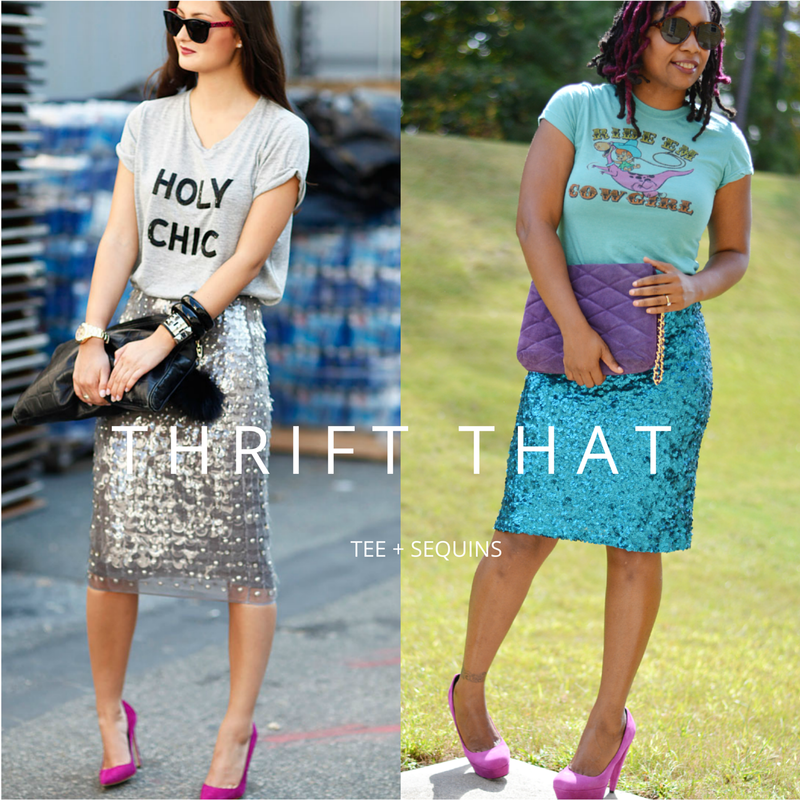 I am on a serious hunt for a sequin skirt/shorts at the thrift stores myself. Loving this look.